There are many reasons why the US dollar may be poised to lose its status as the world’s reserve currency. Not the least of these are efforts by the EU and China to make it happen. But, with apologies to Jean-Claude Juncker and Xi Jinping, Tina tells us it’s not going to happen anytime soon. Tina is the old Margaret Thatcher dictum: “there is no alternative”. The phrase had been in vogue among equity traders (before October’s pullback) given weak returns in other asset classes, but it applies just as well to the dollar these days. 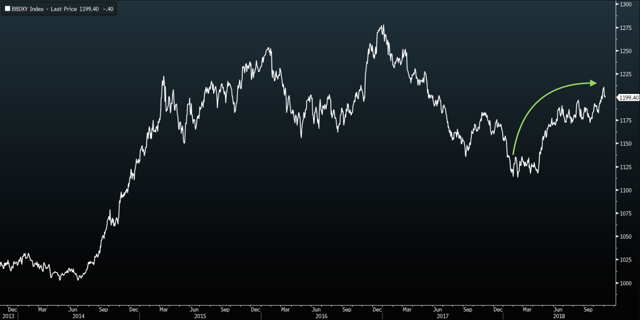 This has been a portentous year for the dollar. Its global share of central bank reserves fell to a five-year low of 62.3 per cent in the second quarter, even as the trade-weighted dollar index surged. Overall foreign holdings of US Treasury debt fell to 41 per cent, the lowest in 15 years. China began trading oil futures in renminbi, challenging the supremacy of the petrodollar. Germany, France, the UK and Russia suggested circumventing the dollar with a new payments mechanism to allow continued trade with Iran while avoiding US sanctions. There are some obvious ongoing risks too. The US owes baby boomers entitlements it cannot afford and yet the government is on a spending spree, drastically increasing national debt. The Federal Reserve is shrinking its balance sheet, reducing dollar liquidity. The administration’s trade conflicts increase motivation for other countries to reduce their dependency on the US financial system and its currency. And yet, I am not worried that King Dollar will be dethroned. For all its faults, Tina protects it. Mr Juncker, the European Commission president, pushed a more prominent global role for the euro in his State of the European Union speech in September. Yet while the euro accounted for the second-largest share of global central bank reserves by mid-2018, its share was only around one-third that of the dollar. It will be difficult for investors to put their trust in the euro as long as there are doubts about the eurozone’s survival, most recently prompted by the Italian government flouting fiscal rules. For all the talk of an insurgent China, its currency is hardly poised to take over. The renminbi accounted for a paltry 1.84 per cent of global central bank reserves in mid-2018. This could change as the Belt and Road Initiative expands — it would be easier for all countries in the project to use the same currency. But the renminbi has a long way to go. It is not freely floating, monetary policy is unpredictable and China’s economy and financial system are not open. 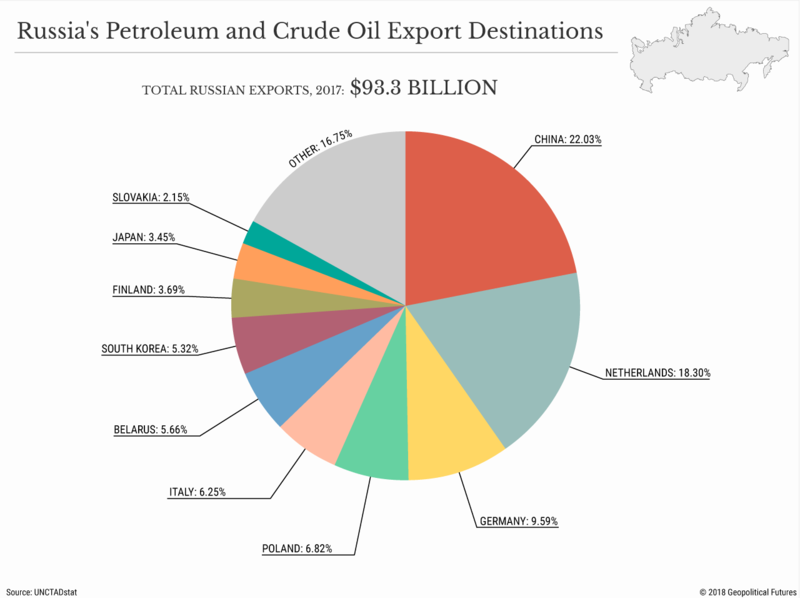 The return of the US as a major oil producer further protects the dollar’s position. The world trades oil in dollars — $2tn of them in 2017, according to business intelligence firm IbisWorld. Finally, the US dollar benefits from a network effect. Around 40 per cent of imports worldwide are invoiced in dollars, even though the US accounts for only about 10 per cent of global sales. Banks and businesses like to use dollars because other banks and businesses do. Some have suggested the IMF’s special drawing rights could be a viable alternative. But the SDR is not a currency, it’s an accounting entry valued against a basket of currencies. The “exorbitant privilege” of having the reserve currency allows the US to borrow beyond its means and on the cheap. Global demands for transacting in the currency support a healthy financial services industry. But demand for the dollar also pumps up its value, making American exports less competitive, cheapening imports and widening the trade deficit. The current administration has made no bones about its dislike of trade deficits. But even if the US were to decide it did not want the responsibility of the global reserve currency, it may not be able to shirk it. Part of the reason for that is rooted in the US Constitution. Two of the three presidents elected in this century assumed office despite having lost the popular vote. 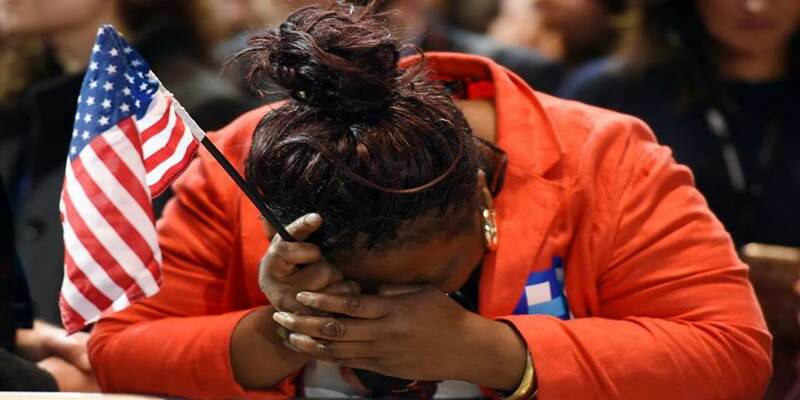 Were it not for the Electoral College, included in the Constitution at the insistence of the less populous slave states, Al Gore would have become president in 2000, and Hillary Clinton in 2016. 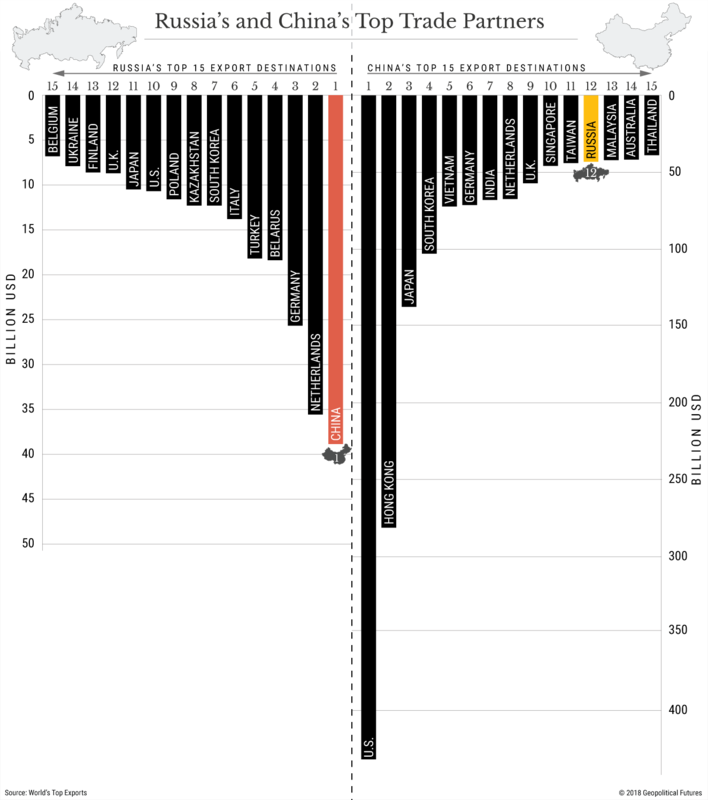 Moreover, a system of mass incarceration that continues to target African-Americans has historically served a triple function. Aside from providing cheap labor and driving down wages (even today, as Columbia University’s Michael Poyker points out, some 5% of America’s industrial output is produced by inmates), this system was designed to deny those convicted of a crime the right to vote. When all else fails, Republicans seek to tie elected governments’ hands, in part by packing the federal courts with judges who can be counted on to strike down policies that their donors and supporters oppose. Important recent books, such as Duke University historian Nancy MacLean’s Democracy in Chains and University of Oregon political scientist Gordon Lafer’s The One Percent Solution, trace the intellectual origins and organizational mechanisms of the Republicans’ assault on democracy. Of course, this is not just an American problem. All over the world, strongmen with little commitment to democracy have taken power: Recep Tayyip Erdoğan in Turkey, Viktor Orbán in Hungary, Jarosław Kaczyński in Poland, and now Jair Bolsonaro in Brazil. Some, looking at the past, say that this, too, will pass. Think of all the nasty dictators in the 1930s. Think of those, like Salazar in Portugal and Franco in Spain, who survived into the post-World War II era. They are all gone now. A moment’s reflection, though, should remind us of those dictatorships’ human toll. And Americans must confront the fact that their president, Donald Trump, has been aiding and abetting today’s crop of budding despots. 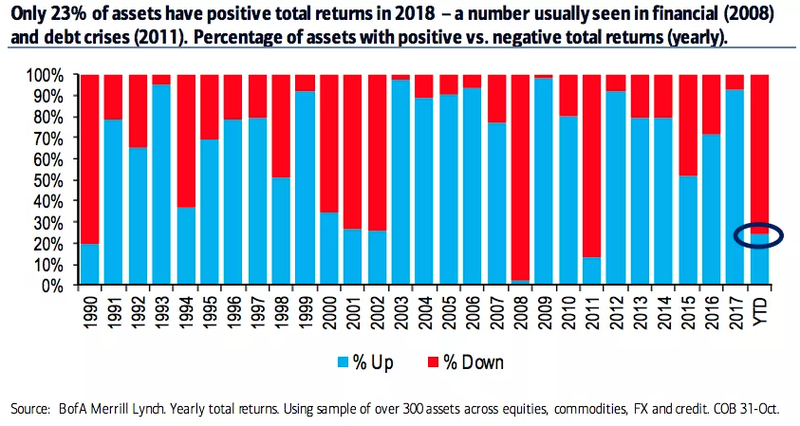 - Well, depending on how wide you want to cast your net, somewhere between 75% and 89% of global assets are negative this year. - If you're looking to explain that rather unfortunate state of affairs, you might look at "cash". - You might also consider that we hit "peak QE" flow in 2018. - This really is not all that complicated. As America goes to the polls and analysts begrudgingly churn out the obligatory deluge of midterm election projections, I thought I'd offer readers what I'm reasonably sure will be a welcome reprieve from the incessant flow of articles documenting how various asset classes have performed under historical instances of split government. Over the weekend, in the comments on my most recent post for this platform, a couple of readers indirectly happened on the simplest (and by extension, the most elegant) explanation for this year's cross-asset malaise. The point there is that Fed hikes (and expectations of developed market monetary policy normalization more generally) are reversing the nine-year-old global hunt for yield that pushed investors down the quality ladder and out the risk curve. The higher USD short rates go, the more acute that reversal is going to be as investors question the relative merits of staying put in risk assets as rates on riskless USD "cash" continue to rise. This dynamic is exacerbated by the waning QE bid. For years, investors were warned that once the QE "flow" effect (i.e., the combined monthly bid from the big developed market central banks) starts to wane, risk assets would stumble. It's funny how controversial that contention was, given how self-evident it most assuredly is. When you have a price insensitive buyer armed with a printing press snapping up billions worth of assets (from govies, to corporate bonds to ETFs) every, single month, it stands to reason that when that flow subsides, prices for those assets will fall, if for no other reason than the fact that suddenly, more of the onus for absorbing supply will fall on price sensitive private investors. There isn't a single thing that's complicated or controversial about that. In fact (and I tried pretty hard to emphasize this point last year), it's not as much a "bear" thesis as it is just a common sense assessment of the prevailing reality. Well sure enough, we hit "peak QE" in 2018 and guess what? Through October 31, only 23% of global assets have managed positive returns in 2018. That’s according to BofAML, who looked at some 300 assets spanning equities, commodities, FX and credit. Long story short, that doesn't normally happen outside of recessions and debt crises. Did your favorite QE skeptic predict that? I'm guessing no. Again, the simplest explanation for that is simply that the policies which ensured a voracious appetite for anything that offered any semblance of yield are being gradually rolled back. 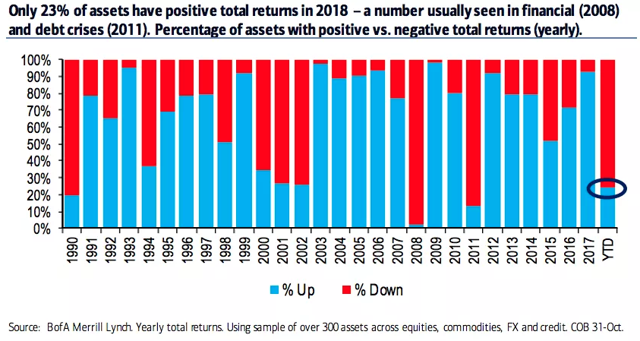 We think it reflects a bigger picture theme: Namely that assets are now struggling to produce meaningfully positive returns in an era of less central bank liquidity. The “invisible hand” that once propped-up market prices is now significantly smaller. That would have been precarious enough on its own, but in 2018, it's been exacerbated by the Fed, which is caught in a rather unfortunate loop. The Trump administration's fiscal and trade policies are dollar positive, at least in the short- to medium-term. 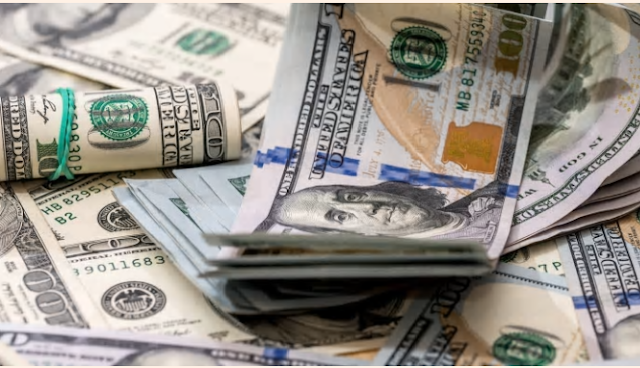 Repatriation flows from the tax cuts and the outperformance of the American economy and U.S stock market have helped support the greenback. At the same time, the inflationary nature of late-cycle fiscal stimulus as well as jitters about tariff-related price pressures, have forced the Fed to lean more hawkish than they otherwise might. The tighter the labor market gets, the more pronounced that tendency is likely to be. That means the monetary policy divergence between the Fed and the rest of the world is wider than it might have been, providing still more support for the dollar. In addition to the waning bid from QE and the gradual rollback of accommodative monetary policy more generally, it's important to note that the backdrop against which all of this is unfolding is profoundly different from that which persisted in 2017. I penned a lengthy piece on this for my site on Monday evening, so I won't rehash the whole thing here, but suffice to say the "Goldilocks" environment of synchronized global growth and well-anchored inflation has given way to what looks like the beginning of synchronized downturn with higher inflation (at least in the U.S.). That "Goldilocks" narrative was what ultimately underpinned the low vol. regime in 2017 which allowed for the proliferation of all the various carry trades and virtuous loops that kept cross-asset volatility suppressed. Clearly, global trade frictions are serving to heighten fears about the trajectory of global growth and the prospect of tariffs is raising concerns about inflation, although as ever, there are structural disinflationary forces pushing in the opposite direction. The overarching point here is that if you're looking for reasons why (almost) nothing is performing well in 2018, a simple explanation is that USD "cash" is rapidly becoming viable again and developed market central banks are buying less assets. Not much of a mystery, really. The bad news is that it's difficult to postulate a scenario where those two bearish forces for risk assets don't continue largely unabated, short of a serious global slowdown which prompts central banks to rethink their normalization plans. 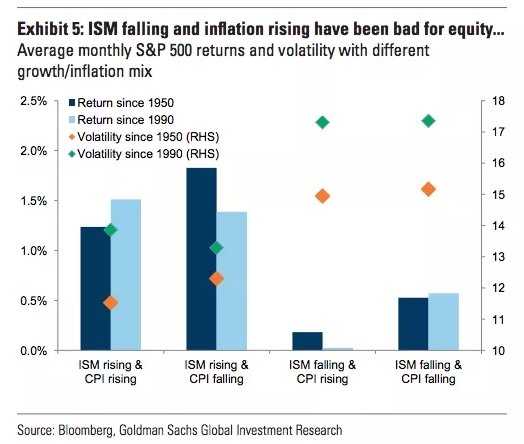 For now, I'll leave you with one last chart which shows you how the S&P typically performs when ISM is falling and CPI is rising.